Whether your truck spends more time on the jobsite or the mud trails, having durable, reliable bed protection is a key element for maintaining both cosmetic and functional value of your truck. 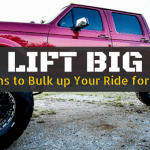 Bedliners are one of the simplest customizations that any truck owner can take advantage of. But like anything, you get what you pay for. Instead of the cheap, plastic drop-ins or sloppy roll-ons, here’s Lone Star 4×4’s top 8 reasons to invest in a professionally prepped, sprayed-on custom bedliner. 1. It Looks Great, Period. A finished liner looks great with an open pickup bed. Spray-on application allows you to select a UV topcoat that matches your color scheme as well. Drop-in liners usually come in standard black, and if you have a custom paint that you’re proud to show off, then why not have a custom color-matched bedliner, too? Spray-on application creates a watertight seal to protect your bed and prevent corrosion or rust underneath. Drop-in liners accumulate water underneath and rust through. Protect all of your custom parts and accessories under the bed with a watertight bedliner. Sprayed-on bedliners provide a thin, durable seal that molds to every surface in your truck bed. Drop-in liners require fitting which can take up additional space. Anyone with a work truck knows that every square inch of your bed space counts, so even inches in the corners means a world of difference. Unlike cheaper drop-ins, polyurethane or polyurea bedliners will last forever. Spray-on lining doesn’t warp, crack, or tear, ensuring that your bed is protected and looks great for years. With expert surface prep, spray-on bedliner application will last the lifetime of your truck. Spray-on bedliners perfectly fit beds of all sizes and shapes. Regardless of year or model, a spray-on liner bonds tight to every contour of your truck bed. There’s no need to worry about finding the right mold or a mix up at the parts counter. Having a durable spray-in bedliner not only looks great – it serves the vital function of keeping your truck bed clear of dings, dents, and scratches. Quality spray-in liners can take abuse day in and day out and keep on looking new for years. Spray-on application can be extended to bedrails and tailgates, which provides both a finished look and additional protection at seams and corners. Professional, detailed prep work ensures that tie-down racks and gate handles are covered completely. Quality, permanent bedliners provide reduced in-cab road noise, especially on windy highways. Cheap drop-in liners often result in noisy vibration, which also wears through paint to expose your bed to the elements. Slip-proof spray liners also keep your stuff from sliding around in and banging into bedwalls. Whether you use your truck for weekdays or weekends – jobsites or mud trails – durable spray-on bedliners will make your truck look rad, last longer, and improve cosmetic and functional value. See what Lone Star 4×4 can do for your truck with custom spray-on application services.